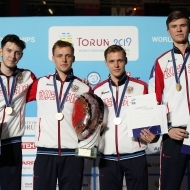 TORUN, Poland, April 10, 2019—Russia’s Egor Barannikov and USA’s Lauren Scruggs won gold medals in individual cadet foil at the 2019 Junior and Cadet Fencing World Championships on the fifth of nine days of competition in Torun, Poland. The field of players included 121 men and 112 women competing in the day’s events. Barannikov fenced France’s Paul Antoine De Belval in the gold-medal final of cadet men’s individual foil, winning with a 15-12 score. De Belval beat Italian Giuseppe Franzoni in the semi-final, 15-12, while Barannikov defeated China’s Jie Xu, 15-11. 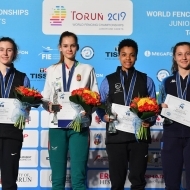 For Scruggs, it was her second world championship victory in two days, having won junior women’s individual foil on the preceding evening. For this evening’s cadet women’s individual foil final, she faced Korea’s Sein Hong, winning the gold with a 15-9 score. Sein overcame Russia’s Valeriya Rassolova in the semi-final round by a single touch, 15-14, and Scruggs beat Italian Margherita Lorenzi, 15-10. The final eight in cadet men’s foil included Egor Barannikov (RUS, gold), Paul Antoine De Belval (FRA, silver), Giuseppe Franzoni (ITA, bronze), Jie Xu (CHN, bronze), Valerian Castanie (FRA), Cameron Evans (GBR), Jean Guillaume (FRA) and Andor Istvan Mihalyi (HUN). Full results may be found here on the FIE web site.